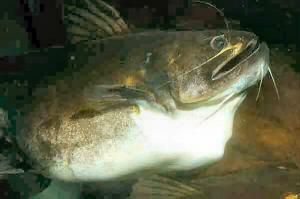 There are many big mouths in the catfish world. Thankfully most of them come with fins attached. Perhaps the biggest of them all is this month's featured catfish, Asterophysus batrachus - well deserving of the name Gulper Driftwood Catfish. The fishes enormous gape relative to its size and its thin, elastic skin allows this fish to simply swallow food whole in an instant. To demonstrate the point, the picture below is of an 24cm Asterophysus which has recently despatched a 40cm male Crenicichla marmorata; previously thought to be safe from the big gulp of the catfish. Although uncommon in the wild, exports are available from time to time by they tend to come with an very high price tag as this is something of a collectable fish. Aside from the catfish connoisseur, this fish also appeals to those who just generally like the unusual or the "predatory fish set" that delight in the bold and lethal. These wonderful pictures come from Oliver Lucanus at www.belowwater.com, Oliver also reports some other aspects of this species both in nature and captivity. The fish is uncommon in the wild where it is found in black water. 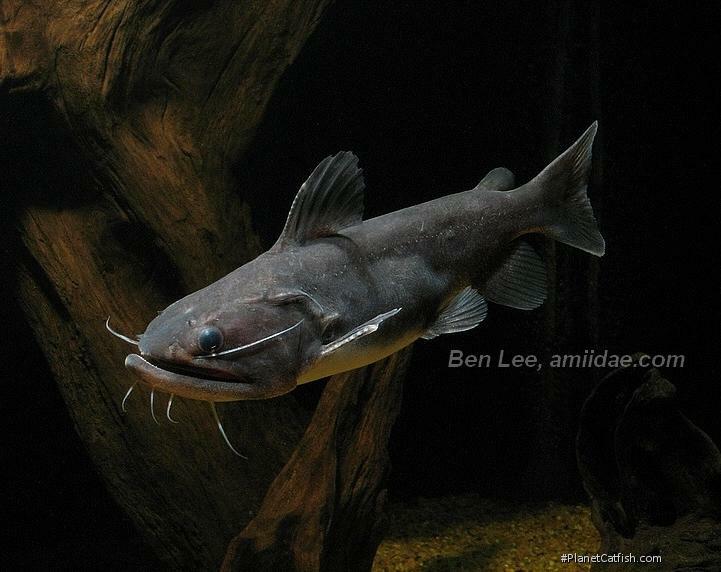 Although described from Brazil it is also found in other countries' black water habitats. In nature, the fish spring into action the moment it gets dark; they cruise around the shallows at that time. While snorkelling I saw them eat angelfish sideways. Further testament to the utility of that mouth! Snorkelling at night with these fish can be extremely unsettling because the fish will try to swallow anything and will try to fit your hand into its mouth from every angle before giving up. The biggest animals I have seen in the wild were around 25cm, my animals are from 24-20cm and have not grown visibly in two years. They may eat fish at least double their own length. The skin on the beast is very thin and flexible, which is why it can extend so grotesquely and swallow anything. Interestingly, threatened animals may blow themselves up with water like a puffer. They are however very easy to keep. I have never seen an infection on the skin, even with deep gouges from the fish trying to swallow each other. I have six fish together for four years, with no interaction, except attempts at swallowing each other especially at feeding time when there is a lot of food such as Krill or large earthworms in the water. The moment there is anything new in the tank the Astrophysus will begin to swim around until they find it and try to swallow it. No matter if it is a net, arm or person or guppy. They know, (amazing in an almost electric fish sensory system sort of way), the moment that a new item has been introduced to the tank. Although they swallow anything in sight, these fish will filter feed when needed - just like a whale shark, daphnia are among my monsters favourites. So, a certain candidate for the ultimate aquarium-suitable predatory fish; certainly one of the catfish worlds impressive predators.